Gain cultural experiences abroad while taking classes that will count for your degree at Cal Poly! Your first step towards studying abroad is attending the mandatory Study Abroad 101 workshop. At the workshop, Study Abroad Advisors will guide you through goal setting, financial and academic planning and inform on your study abroad options. You must RSVP in order to attend a workshop. To learn about the workshop dates and to access the RSVP link, access the Study Abroad 101 Workshop webpage. The Cal Poly International Center provides an overall picture of possible countries. They have many resources for you to use both online and in the office. We recommend students plan their trips abroad for Summer or Fall to ensure staying on track at Cal Poly. If you are interested in studying abroad for a full year you may not be able to find enough classes to substitute and it could extend your graduation date at Cal Poly. Most students take four to five courses while abroad per quarter/semester (less for summer). If the class is not listed on the Study Abroad Pre-Approved List, you must schedule an appointment with an Orfalea Peer Advisor to fill out a course substitution form. If the class is not listed on the GE Pre-Approved List, you must schedule an appointment with the International Center to discuss other potential options. The Cal Poly International Center website explains many financing options. You can find a brochure on financing your Study Abroad trip here. If there is a course you would like to take that is not on the pre-approved list above, you will need to submit a course substitution petition. We recommend starting the course substitution process immediately after you decide on a program and the courses you will be taking. The process can take over one quarter and should be completed prior to departure. 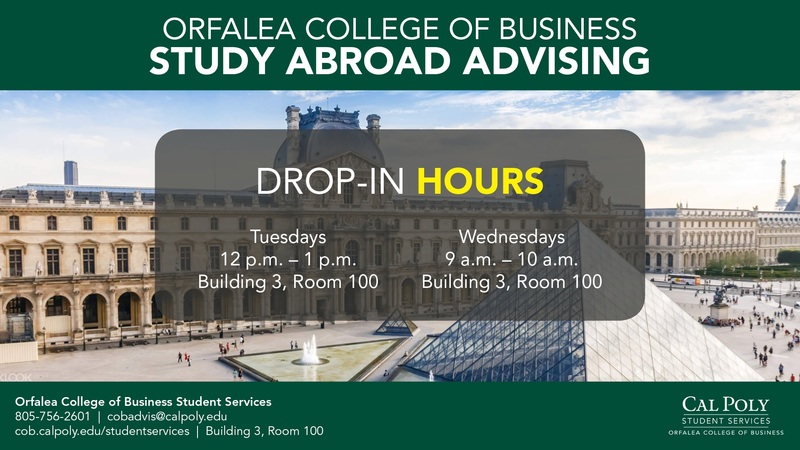 If you have questions about which classes to take abroad or which classes will substitute please make an appointment with a Study Abroad Peer Advisor at Orfalea Student Services. If you would like credit for a Major, Support or Concentration Course at Cal Poly, bring the course description to Orfalea Student Services (Building 03, Room 100) and fill out the Study Abroad Petition for Course Substitution Form. If you would like GE credit, bring the course description to the Cal Poly International Center (Building 52, Room E32) and fill out a Study Abroad GE Substitution Petition Form. Check in with your program regarding details of visa requirements. If you have more questions, make an appointment with Orfalea Student Services to meet with a Study Abroad Peer Advisor.